Looking for something as powerful as a Dyson upright vacuum but that doesn’t cost anywhere near as much as a Dyson upright vacuum? We’ve got just what the doctor ordered. 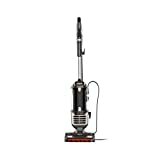 The Shark DuoClean Upright Vacuum for Carpet and Hard Floor Cleaning is on sale for one day only on Amazon, and it’ll only cost you $159.99. It has suction that easily rivals Dyson, but it has a few features you won’t find on any pricey Dyson models like an integrated lift-away hand vacuum! Duo Clean Technology features a bristle brush to deep-clean carpets and an additional soft brush roll to pull in larger particles and directly engage floors for a polished look.